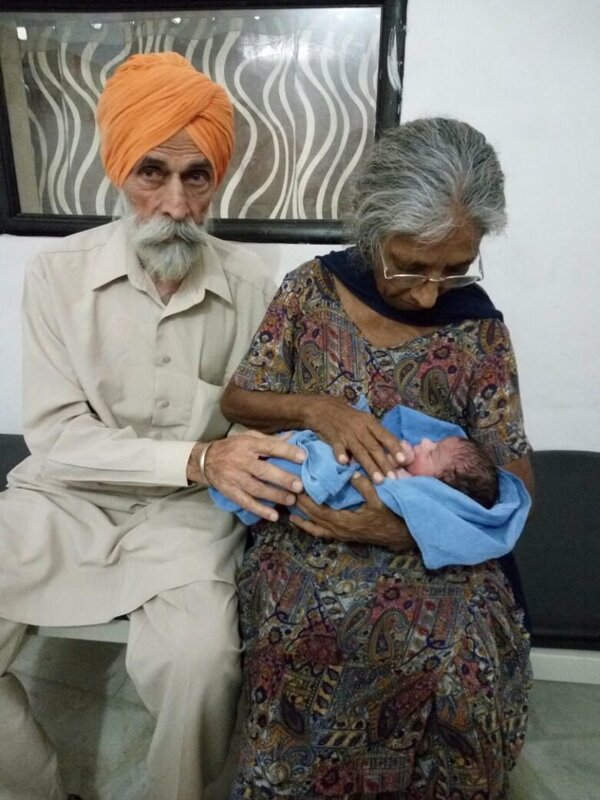 Seventy-two-year old Daljinder Kaur delivered a healthy baby boy, Arman Singh, on the 19th April 2016, after 46 years of marriage and 20 years after menopause. Mrs Kaur and husband 79-year-old husband, Mohinder Singh Gill, were desperate to have a child, and their wish was fulfilled through the in-vitro fertilisation (IVF-test tube), wherein the eggs and sperm are fertilised outside the womb, in a test tube. The couple had been travelling from Amritsar in Punjab to Hisar in Haryana since 2013 for IVF treatments. After two failed IVF cycles, Mrs Kaur finally conceived in July last year. “The woman came to me alone first in 2013, after reading about us in a paper,” said Dr Anurag Bishnoi, embryologist and owner of the National Fertility and Test Tube Baby Centre in Hisar. This is the second case at the centre where a 70-year-old woman has delivered successfully through IVF. The first case was of 70-yearold Rajo Devi in 2006, who had given birth to a baby girl. In 2008, a 66-year-old woman had given birth to triplets — two boys and a girl, at the centre. “Our track record in handling IVF in older women has been fairly good, but not everyone is fit to conceive. In her case, she looked visibly frail too, so I had to refer her to a cardiologist to get clearance for the procedure and a battery of other tests to ascertain fitness levels. We started work within two months in 2013 but the first attempt failed, which is normal. After six months, another attempt was made and that also didn’t succeed. Finally, the third attempt was successful,” said Dr Bishnoi. Doctors say her infertility was most likely due to tubal blocks. “Her fallopian tubes were blocked and no attempt was made to detect the cause when she was menstruating. The procedure could have worked better then had efforts been made,” he said. The husband blames it on a lack of awareness and a family feud that was on for years because of which they didn’t get time to see a doctor. “It was embarrassing to not be able to produce a child, no doubt, but we have been busy with litigation all our life and hardly had time to think it over. After we got a little free a few years ago, we thought of trying for a baby. The newspaper article was spotted at an opportune moment, I’d say,” said Mr Gill, a farmer and now a proud father.